I've got another teenager this week. You'd figure this would be a point of great stress for me but as much as I joke about teenagers, I've been pretty blessed when it comes to having good kids. They're well behaved, they get good grades, and their classmates still view me as slightly unstable, which solves any issues that might arise among potential suitors for my daughters. It's really been a fairly easy ride, and the only real point of conflict in our day to day life is getting them out of bed, and their newly found opinions on our destinations for travel. 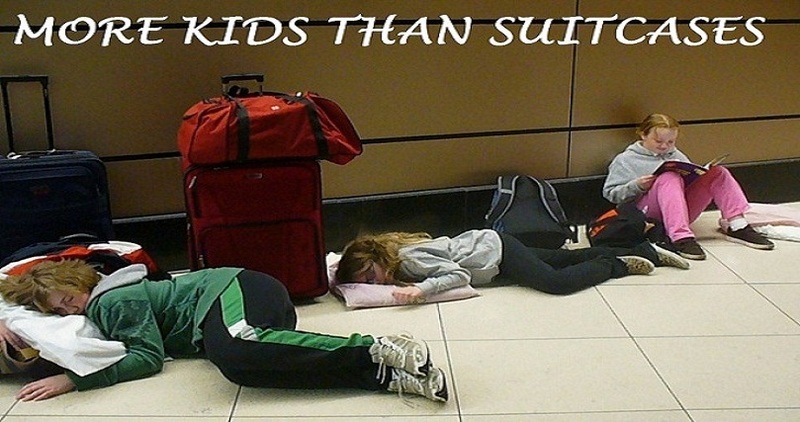 Traveling used to be a lot easier when my kids were younger. All you had to do was strap the kids in the back of the car and off you went. Nobody ever questioned the destination, the route you were taking, and they certainly weren't concerned with what kind of Trip Advisor complaints the hotel we were staying in had received. All they cared about was that Mom and Dad were there, in control and paying for everything. At least that part hasn't changed. Now that we're reaching their teenage years though, my kids have opinions. If I suggest a new travel destination that we haven't been to before, there's questions to be answered. "Are there any great roller coasters? ", "Where's the nearest outlet mall? ", and "How many cute boys will be there?" all need to be researched and answered before any vote on my plan can be held. If even one of the questions has a negative response, I'm going to have to make a very creative case for why my suggested itinerary should be adopted. I kind of feel like Obama trying to pass something in the House. I know that if it comes down to it I can use my executive power, but I'm not sure that I really want to deal with the ramifications of that course of action. I can picture my family getting together to decide who will write the rebuttal to any blog posts I create for a destination that I force into being. Fortunately, traveling with teens isn't all bad. There's good things about my kids getting older, like the fact that I've probably ordered my last Happy Meal (unless McDonalds and Disney team up again). Flight delays are only an issue if there's nowhere to plug in electronics, and when your credit card gets rejected at check-in, there's five people to pool money together for the cash deposit instead of two. We're also long past the age of having to break for afternoon naps, although it's a sad fact of life that just when the kids don't need naps anymore, the adults start to realize what a great concept they truly are. Truth be told though, it doesn't really matter what I think. It's not like I get a vote in the matter, and my kids are getting older whether I want them to or not. Pretty soon their lives are going to hit the same level of crazy that mine did years ago, which means there's not a lot of time left to do some traveling as a family. I'm rapidly approaching the term limit for head travel planner, so if a little bipartisan cooperation is what it takes to keep things moving, then I'm willing to take that path. I just wish the voting age for travel destinations was a teeny bit higher.